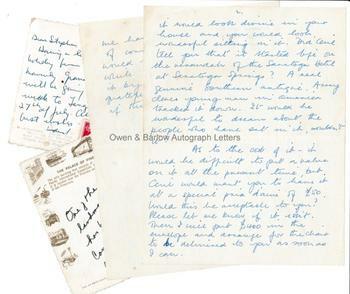 STEPHEN TENNANT Autograph letter signed and a small collection of related material addressed to him, including letter from Cecil Beaton's assistant and companion, Eileen Hose and post-cards from his brother, David Tennant. Stephen James Napier Tennant. English poet, artist, aesthete and socialite. Called 'the brightest of the bright young things' and the model for Sebastian Flyte in 'Brideshead Revisited'. ALS. 1p. Royal Bath Hotel, Bournemouth. March 1961. To "My dear Ida" [the photographer Ida Kar]. "Let us take some lovely photos at Wilsford - shall we? My book of poems (in April) 'My Brother Aquarius' will be out at Easter - or just after. I would love so a beautiful new picture in my darling terrace - by a fountain, with tulips. Love to you dear Ida, Stephen." He adds two notes at the head of letter: "Who is Billy Fury?" and "Did people like my photo?" 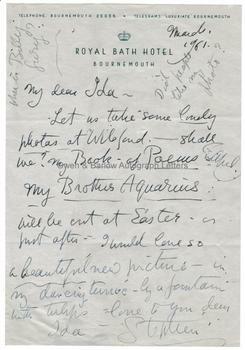 Together with a long ALS from Eileen Hose, Cecil Beaton's companion, to Stephen Tennant. 4pp. Reddish House, Broadchalke, Salisbury. 16th July 1973. She speaks of a payment of £450 in cash that Cecil [Beaton] wants to give Tennant and also of an antique Southern wicker chair that came from a hotel in Saratoga Springs that Cecil wants him to have ("you would look wonderful sitting in it"). She wishes him luck with his exhibition ("Cecil will keep me in touch") and thanks him for the gift of a ring and that she will be proud to say to her friends how she came to have this. She asks for a copy of his poem 'Which Horse Do You Ride?' so she can learn it by heart. 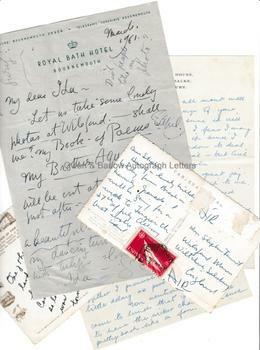 Together with 2 autograph notes on post-cards to Stephen Tennant from his brother David, the aristocrat and socialite and founder of the Gargoyle Club in London's Soho. These are brief messages from holiday destinations in San Francisco and Granada. The Stephen Tennant ALS is 4to, 22.5 x 15.25 cms (8.75 x 6 inches). Some old creases and slight water mark to bottom left corner. In very good condition. Stephen Tennant was born into an aristocratic Edwardian family. His father was Lord Glenconner and his mother was one of the Wyndham girls of 'The Souls' clique and a cousin of Oscar Wilde's lover, Lord Alfred Douglas. On the death of his father, Tennant's mother had married Viscount Grey of Fallodon, British Foreign Secretary and noted ornithologist. Stephen Tennant was the most conspicuous of the 1920s set, known as 'the bright young things'. His friends included Cecil Beaton, the Mitford sisters, Rex Whistler and Lady Diana Manners. He was the model for Cedric Hampton in Nancy Mitford's 'Love in a Cold Climate' and for Lord Sebastian Flyte in 'Brideshead Revisited' by Evelyn Waugh. Waugh also used Tennant as his inspiration for Miles Malpractice in 'Vile Bodies'. His eccentric and extravagant lifestyle and mode of dress led Virginia Woolf to call him her "bird of paradise". In later life, Tennant features prominently in V.S. Naipaul's 'The Enigma of Arrival'. Stephan Tennant was the lover of Siegfried Sassoon in the 1920s and 1930s before Tennant rather abruptly jilted him. 'Wilsford' was Stephen Tennant's home in Wiltshire. It is rumoured that he spent the last 17 years of his life in bed there and living as a recluse, surrounded by his stuffed animals, letters, bottles of scent and his pet lizards. Ida Kar was a Russian born society photographer, much influenced by the French avant-garde. She had photographed Stephen Tennant on several occasions. Provenance: From the personal collection of the late David Mayou, literary collector and bookseller.